Relenza is a medication that is used to combat influenza. It has two uses - firstly, it is taken to reduce the severity of flu symptoms and help you recover more quickly, and secondly in the case of an influenza outbreak, it can be taken to reduce your chances of getting infected. Relenza is part of a group of medicines called anti-virals. This means it is part of a class of drug that helps combat viral infections. Viral infections are harder to treat because they live inside our cells, making it more difficult for our immune systems to identify and attack them. The key ingredient in Relenza is Zanamivir. It acts by inhibiting an enzyme called neuraminidase, which stops the virus being able to reproduce. How do I obtain Relenza? The Online Clinic is happy to prescribe Relenza on a precautionary basis so you can get this medication prescribed in case you develop flu symptoms. 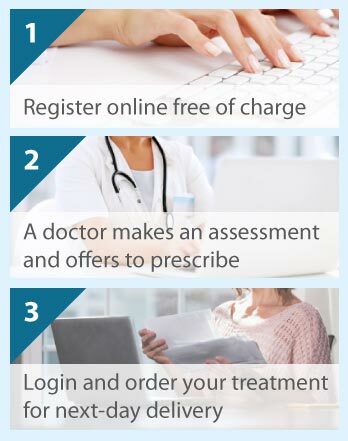 As Relenza is a prescription medication, you will need to complete an online consultation form before we can approve you to purchase this medication. If you already have flu - for maximum benefit start taking the medication as soon as you notice symptoms. For adults, take it within 48 hours of the first symptoms manifesting, for children within 36 hours of the first symptoms. If there is a flu outbreak within your local community - seek advice from your doctor as to when you should start using Relenza. Relenza needs to be inhaled, because when it is swallowed the body does not absorb it as well. The flu virus acts in the lungs, so when the medication is breathed in it can work directly on the virus inside the lungs. Relenza is administered via a plastic device called the Diskhaler. Once the inhaler is set up, you take a short deep breath out, put the mouthpiece between your teeth and close your lips about it. Then you take a quick deep breath in and hold it for a few seconds. Then you take the diskhaler out and keep holding your breath for a few more seconds or as long as is comfortable. The dosage of Relenza depends on what you are using if for. If you already have flu, then for adults and children the usual dose is two inhalations twice a day for five days. If someone is your family already has flu and you are using it to prevent infection, the dose is two inhalations once a day for ten days. If there is a flu outbreak in your local community, then the recommended dose is two inhalations once a day for up to 28 days. Is Relenza a flu vaccine? This medication is not a substitute for the flu vaccination, so you should speak to your doctor if you think you need to be vaccinated against flu. If you do need to be vaccinated, the fact that you have been using Relenza will not interfere with this. Relenza is suitable for adults and children over 5 years old. It should not be taken if you are allergic to zanamivir or allergic to lactose or milk protein. Although there is no evidence so far that taking Relenza when pregnant harms your baby or you, there is limited information about its effects during pregnancy. If you are or might be pregnant, then consult your doctor before taking this medication. If you are breastfeeding, you should not take Relenza as it can get into your breast milk. Special care needs to be taken if you are asthmatic or have another condition that affects your breathing, like emphysema or chronic bronchitis. If you already take inhaled medication for breathing problems like asthma, you should carry on using your inhaler at the usual times. If you have been told to take the Relenza at the same time as you take your other medication, then use the other medication a few minutes before you use the Relenza. Make sure you have your fast-acting 'reliever' inhaler to hand when you are using the medication. Very rarely, Relenza can cause tightness in the throat and chest or breathing difficulties - in this case, stop using the Relenza and get medical help immediately. We prefer not to prescribe Relenza to anyone who has respiratory problems. We would normally recommend Tamiflu as a substitute for Relenza in these circumstances if Tamiflu is appropriate. Tightness in the throat and chest, feelings of shortness of breath or sudden difficulty breathing. Special care needs to be taken if you have a prior lung disease and you will need to be monitored while on this medication in case this side effect manifests itself. If you get any of these effects, stop using Relenza and seek medical attention immediately. Contact your doctor or the nearest hospital emergency department. These symptoms are associated with patients with flu who are not taking Relenza, so it is not known if the medication plays a part in causing them. Parents should be especially careful to monitor their children for these side effects. If you do notice these symptoms, immediately contact your doctor.